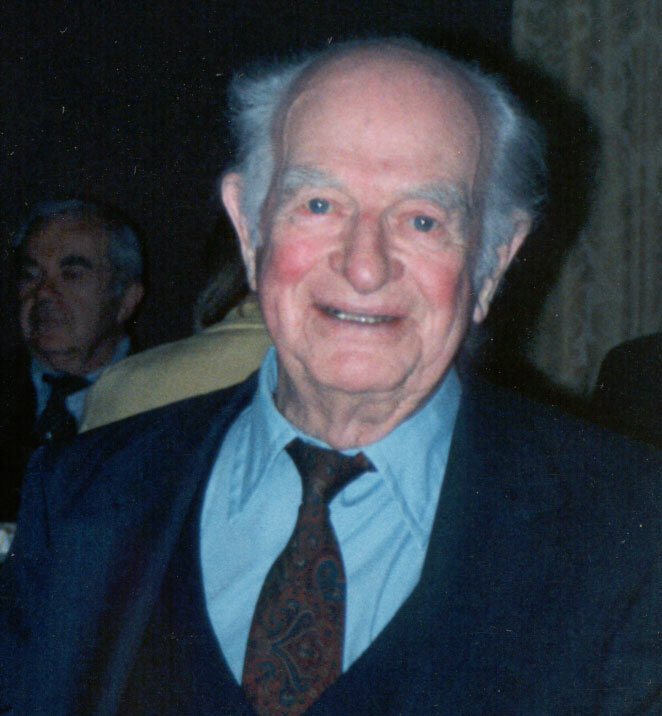 In the early 1990s, Linus Pauling and Matthias Rath drafted two patent documents not related to their lipoprotein(a) research – documents that did not ultimately result in finalized patents. One of these documents described an attempt to use synthetic polypeptides to prevent disease by helping synthesize an optimum level and strength of collagen in the body. “Polypeptide and Methods of Use,” application drafted July 10, 1991. A polypeptide is a linear chain of two or more amino acids linked by a covalent bond. Scientists had asserted that synthetic polypeptides would be ineffective because polypeptides are fairly conservative molecules and, as such, trying to recreate them would result in substances with little or no potency. Pauling disagreed with this sentiment completely and utilized synthetics for the purpose of his research because they were fairly easy to manufacture. 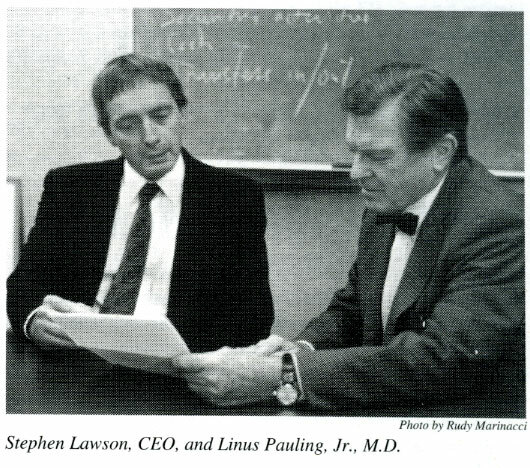 Pauling and Rath believed that synthetic polypeptides would remain viable and that arguments against them were based in a fundamental misunderstanding of what makes a polypeptide potent in the first place. 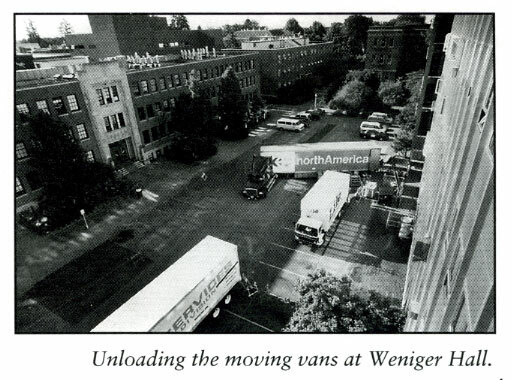 A polypeptide chain with an arginine-glycine-aspartic acid (RGD) sequence was, specifically, what the duo was investigating, and the RGD sequence is the piece of the puzzle that many scientists felt would be a source of potency trouble in synthetics. Pauling and Rath felt that the RGD sequence was not actually important, but that the R and D was important. Specifically, beginning a chain with R (arginine) then ending it with D (aspartic acid) – both highly polarized end peptides – was the key to imbuing a polypeptide with strength and usefulness. In the eyes of the two researchers, if R and D were in the right spots, it did not particularly matter what resided in between them. 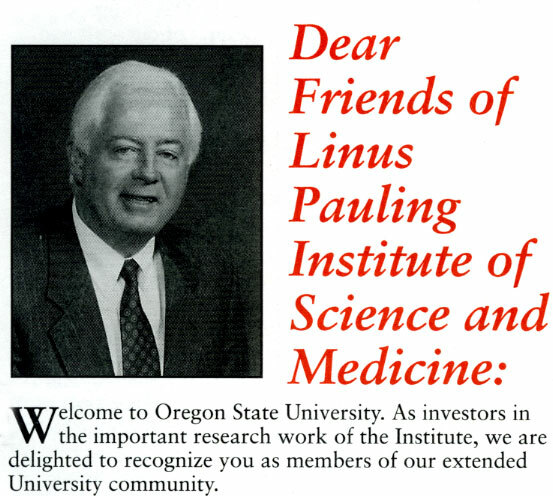 Pauling and Rath’s polypeptide treatment was designed to treat diseases that were related to cell migration or cell membrane adhesion. The treatment would cause certain cells more difficulty in penetrating membranes or just migrating in general; so ideally, it would contain diseases such as metastatic cancer. Also, by preventing membrane penetration and adherence, diseases such as infectious viral agents – which rely on doing just that to spread – would be contained as well. 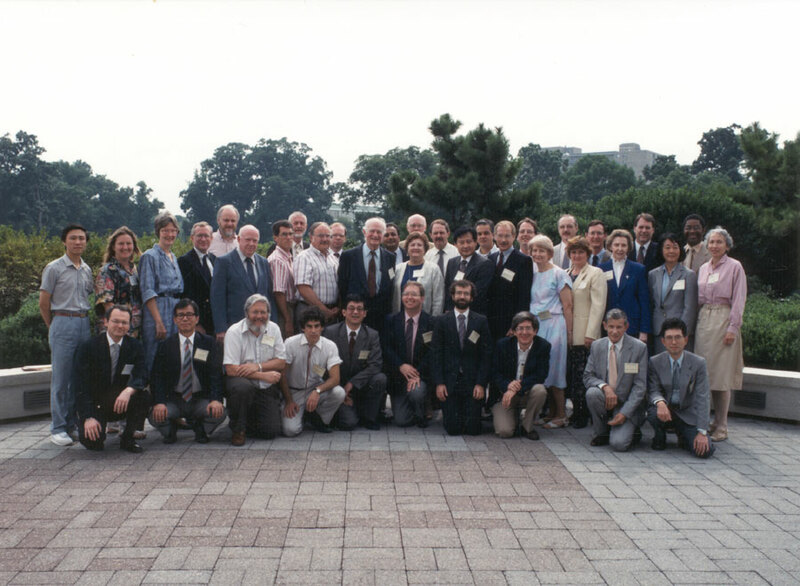 “Treatment of Pathological States Related to Degeneration of Extracellular Matrix System Treatment,” application declaration drafted November 1, 1991. The last patent considered by Pauling and Rath was titled “The Treatment of Pathological States Related to Degeneration of the Extracellular Matrix System.” The extracellular matrix (ECM) provides structural support to animal cells, is the defining feature of connective tissues and serves other important duties in the cellular structure. The November patent idea was for, once again, a Vitamin C mixture, this one designed to prevent the deterioration of the ECM, thought to both contribute to and be characteristic of the spread of diseases, specifically metastatic cancer. 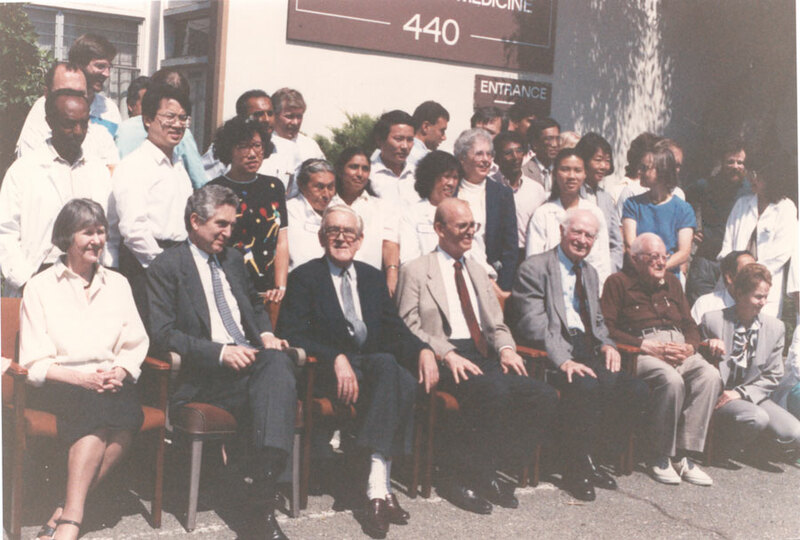 In this instance, Pauling and Rath’s research revolved around apoprotein(a) [apo(a)] which, they theorized, acted as a sort of temporary surrogate to Vitamin C. When Vitamin C levels in the bloodstream drop, apo(a) and lipoprotein(a) levels increase. Apo(a), a crucial component of the body’s defense against disease, was seen as acting as “temporary Vitamin C,” which in the short term was beneficial, but after longer periods of time would actually contribute to ECM deterioration and other health issues. 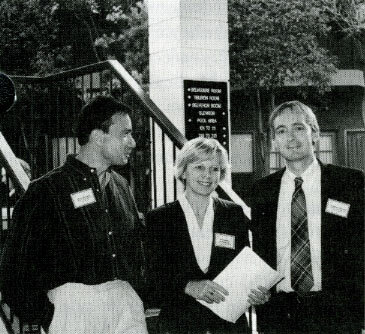 Pauling and Rath worked with Dr. Aleksandra Niedzwiecki and Dr. Jerzy Jurka on this project, and they all concluded that apo(a) helped the body to fight free radicals and other diseases. This said, the team also felt that apo(a) needed the help of large amounts of Vitamin C to be effective, especially because, as the body became sick or fought off illness, Vitamin C levels in the blood dropped. As such, large doses of Vitamin C were the best course of action to ensure the strength of the ECM and subsequent general health. 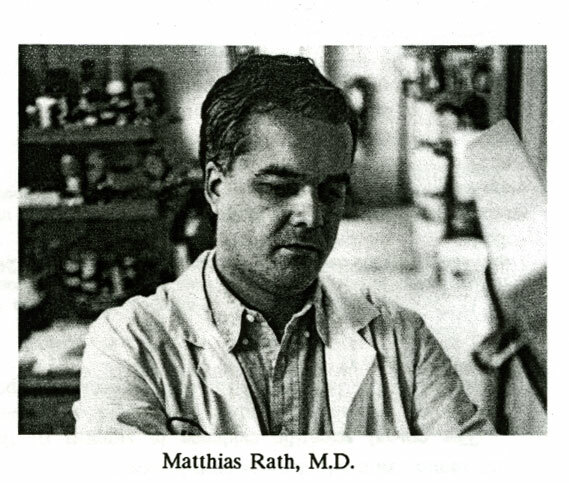 Matthias Rath departed from the Linus Pauling Institute of Science and Medicine in 1992 and Dr. Niedzwiecki moved to work with him at his new institute. 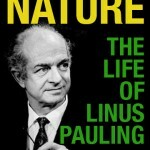 Linus Pauling was already fighting his own cancer at that time and ultimately died in August 1994. As a result of both events, the patent applications initiated in support of the two initiatives described above appear not to have been vigorously pursued.